PC Matic just keeps getting better. Behind the scenes we’re working at a feverish pace to provide the absolute best software on the market. Innovation combined with an excellent user experience is what we’re after. Open your PC Matic program and notice another new feature that has just been added. Click on the Community button , choose the software title you are looking for and chat with other users about the application. Hot items on the list include PC Matic, Google Chrome, and Windows Internet Explorer. Find out what others are saying about the new Internet Explorer9 or Acrobat Reader. You can expect a feature rich chat experience with regular category updates and additions. Having a problem with our programs on your system? 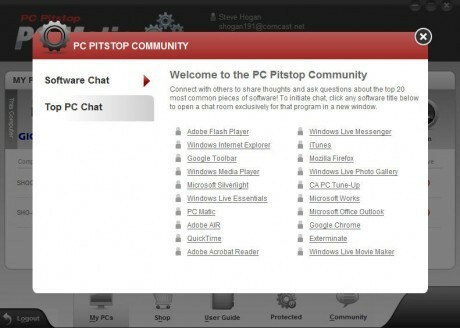 You should still access our Tech Team through the PC Pitstop Customer Service Center . We’re there day and night to answer your questions and solve your problems. We pride ourselves on offering the fastest and best service possible. Doug, Sheila, Vince, Megan, and I are all waiting to provide you fast and concise answers . We love what we do and enjoy helping you get the most from our products. Give us your thoughts on this new feature. You can add a comment below or better yet, chat about it in the PC Matic Community. PC Matic Blog, Press chat pc, Community, community button, concise answers, Customer, feverish pace, market innovation, Open, pace, pc matic, Service. permalink. I used pcmatic for three or 4 years on my old computer, and the results were great! It was Windows Vista, and pcmatic kept the old POS up and running; not one virus got through in that period of time. I recently purchased a refurbished Dell computer that runs Windows 10. Due to my basic computer ignorance, I had trouble getting the pc matic up and running for a day or two. I did use the computer for an hour or two during that time to finish getting it customized and forgot that I had turned off the Windows Defender firewall. I got pcmatic installed the next day and was cruising websites on Firefox. I got a nudge or two to use Windows Edge browser, but kept on. I finally got on to the search page again, and a warning popped up from, supposedly, Microsoft telling me that I was infected with a dangerous Trojan virus: RDN/Trojan.Worm!055B3C544782, and there was a link provided to Microsoft support contractors who could remedy the problem. A phone number was provideded. I called the number and a person with a foreign accent, near eastern, informed me that my virus protection wasn’t up to standards (!) He asked me how much I was paying for my protection, and I said $50. He told me that you couldn’t get adequate protection for less than $150 . I thanked him and hung up and ran pcmatic again; the results didn’t include finding a Trojan virus. This is a tech support scam. It is a good thing you did not pay for them to “fix” your computer. Your instincts were correct.